If there was one thing you could change on Tookapic, what would it be? It can be design related, or change of rules, maybe something more technical? What's the biggest pain or inconvenience for you when using Tookapic every day? 120mr For me the most improtant thing is the photobook with the whole year in it. So simply: please leave us big photobooks. jazzie A place where you can see the pics anonymized -> likes because pic is good and not because you have lots of tookafriends. I feel like when I started tookapicking one got likes because of his/her pics and nowadays it is because he/she has many followers or likes many pics her-/himself. Hopefully I'm wrong. vera I also thought of that! Could we have one day in the week anonymous photos til we like it? tigg Interesting. As an example: I do not follow many people as I do not have enough time to look at them - sometimes I hardly glance at other entries. The flip of that is few people follow me either! Of course you can often guess whose photograph it is anyway. Szymon Maciejczyk So what now, you going to change it or what @Paweł ? Łukasz Brożek It's color of the year so I think it should stay. I like it. Paweł Kadysz If the color is THE only thing you'd change, then I feel accomplished. 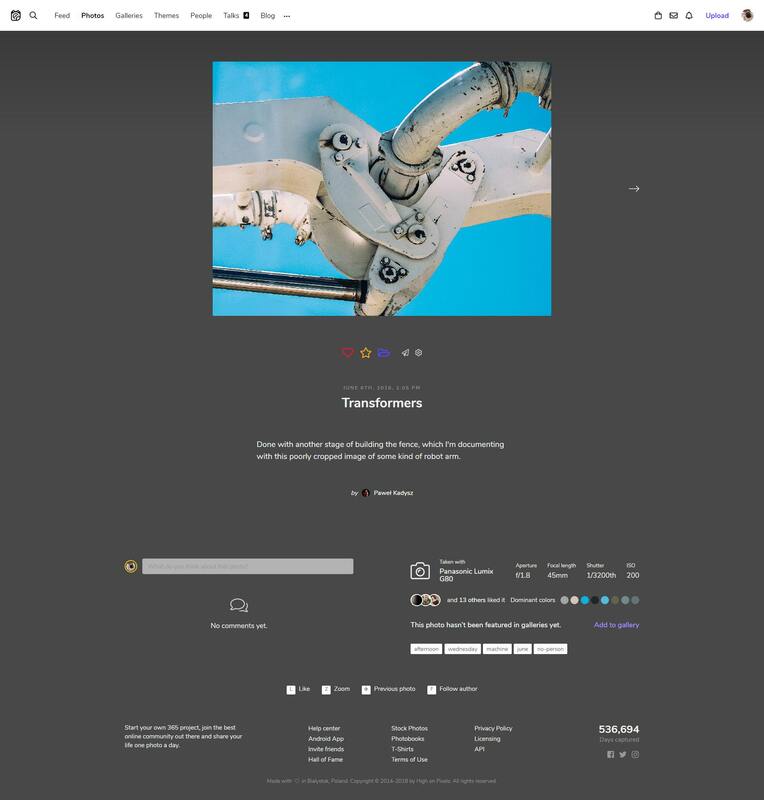 As a viewer I want to browse pictures from a given view (featured, following, recent, etc.) in a full screen just by clicking on the picture side for the previous/next so that it fells like scrolling a photo album. Paweł Kadysz @Kazziz once pitched me this idea. I thought it was awesome. And I still think so. We may even take it bit further and make it a full-screen slideshow. Filip Łannik I would change one thing in the Tookapic App. I would add a posibility to give a stars for a favourite photos. Paweł Kadysz What do you mean by that? Rafal We cannot see the author of the picture for few days. So everyone votes for a photo not because he likes his author only because he likes it in terms of technical, artistic or emotional. Incognito mode will disappear after 1-2 days. Paweł Kadysz This is interesting. vera We are human...don't forget ;)! And sometimes we want to encourage some people in their progress! That's also a nice attitude. But I also would like to have the opportunity to be not influenced by the names. That's why I think it would be nice to have a special page without names, at least you don't see the name till you like the photo. We should see the name AFTER we like the photo. vividcolourfabric What about a star counter? I get the idea - you don't want to let us know who gave us that star but at least let us know how many stars a photo has. vividcolourfabric I meant my own photos. You're right - being able to see how many stars other people get would be too much. tigg On another site I belong to, we get a notification when someone we follow has reached a milestone. Such as completed a year, hit a significant number. I had been thinking about my 1000 for quite a while, and whilst it didn’t work out as planned ( nothing new there) I felt it just was another day on Tookapic. ( lots of people did notice though - thank you!) But that is just an example of a milestone that followers may like to know about. Ian Prince Yeah recognition of milestones (whether one week, one month, 100, one year, two years, 1000 etc) would be a great feature. Magda Ko I would change algorythm on popular page. IMO the same pictures stays on the top of the list too long. mobile version - I missing the possibility to see photo of the day, featured photo, found tripled menu bar bit to much - and this is quite important for me when I travel, I never take laptop with me, nor tablet etc. tigg Well I am rubbish at post processing - everything I do is trial and error with basic software I just wish I was interested in Lightroom, or photoshop, or affinity to name but a few! Paweł Kadysz I'm not mad. How can I be mad? This is very good feedback. Weronika Ja się zgadzam w 100% z dziewczynami Mam już sprzęt od blisko miesiąca i pewnie jeszcze ze 2 miesiące potrwa zanim nauczę się go dobrze używać potem umiejętnie przenosić zdjęcia tak aby móc je publikować a mam już na koncie 200 zdjęć. Marcin K. Editing descriptions of the photos (but also editing comments and other texts): I know that tookapic uses a kind of markdown for rich text, but it is kind of weird and differs across different text editors on the site. Is there any chance to get a cheat sheet or something either in help center or as a part of UI (some kind of tip note)? I guess that adding a fully functional rich text editor may be too complex and too heavy. Satoshi T I think Tookapic has a weak search function. Now I can get "this person's picture" or "Christmas pictures". But I can't find it eg. "a pic that this person took around Christmas in 2015". Likewise, if I want to find "photos taken around Autumn 2015" I can not do it well. What I want for Tookapic is: In a gallery of a person, to specify the date I would like to see. And if you have a way to search ”AND” condition of multiple tags, please let me know. Paweł Kadysz This is actually in progress. I just need to find a way to make it really easy to understand for non-tech people. We got it working with "taken:[2018-01-01 TO 2018-02-01]" added to the search query, but it's too complex and will not be used by "regular" users. Looking for better ways to do that. Maybe we'll just add an advanced search page. Satoshi T "for non-tech people" I understand. tigg Wish I could understand these domain features; but then IT is your profession. Joe Fortin Don't think this is a feature yet, but... I'd love to be able to browse photos based on where they were taken. For example, being able to open a map, zoom in, see thumbnails of other tookapicers (can I use that was a collective noun?) in my area. tigg I often wonder about the geographical spread of members. Obviously Poland and Switzerland would be top .... I imagine most people do not have the GPS function switched on in their camera so the map feature is weakened only by contributors such as me. Margie I am so interested where people are from. I like this idea. Ian Prince @tigg The idea is to have a map of where members says they're from, not where the pics are taken. Of course not all the members set that in the profile...which I respect. Dan Mundy I'd like some kind of solution to this: My feed always seems to have the same kind of photos, and the same few people. The same kind of photos that I keep seeing, isn't even the kind of photography that I find interesting. That's not to say they're bad photos, just not my type. I'd like a ways to be able to choose the type of photography that I want to see more of (people, portraits, family, etc) and also choose the type of photography that I want to see less of (flowers, street photography, landscapes, etc). Mikołaj Have you tried tookapic.com/people ? Dominique I would change the community talks. 1. I find it annoying that I can't "mute" a thread without clicking on the thread. 2. When opening up a thread I'd prefer to go directly to the newest comment. jazzie The second point is important for me too! tigg Rankings .... does anyone now look at this feature? As a supportive but not terribly active member I used to enjoy the steak and total photographs lists. I’m never going to move in the combined ranking as I don’t invite people to join, don’t follow very many people and most unlikely to ever get a photo featured. So, I don’t look now. Having just hit 1000 I would have been interested to see how many others have done that - 20 or 200 or 2000? Absolutely no idea: not that it matters but curiously somethings raised its head! Kateli And if you order a photobook you get loads of points, I ordered two not long ago and shot up one place in the rankings... because I spent money on a photobook. I don't really think the calculation is very appropriate. Couldn't we use number of followers, of likes, of stars, streak... things to do with our 365 challenge ?? But saying this the people having been in tookapic a long long time will always be in front of the others... Is this feature that important ?? torero "No-postproc" day. I'd be glad to see the day in which only pure "raw JPG, no LR" are sent and see the Pics Masters, not only LR Ones. No idea it could be only based on people's trust or there any methods to detect the potential frauds but I think it would be a good point to see what pure inputs are. Especially that it seems to me more and more than vast majority of TP photos - far more than I thought at the beginning - has been post-proc'd before sending (although I do it as well...). Łukasz Brożek It's good idea for "straight_from_camera" weekly theme, category or gallery, but I don't think that here should be a feature like "no-postproc" day. Digital cameras postprocess images. Photography is equal to postprocessing. It's a bad idea to make something like this in my opinion. Michał Good point. When shooting JPGs, postprocessing is executed in camera - sharpening, creative modes, B&W, etc. Łukasz Brożek Maybe it's a good idea to be able to upload 2 the same images (processed and unprocessed) and see it on compare view like in LR? But it may be confusing at the same time and some people would like to use it to upload two different photos. Łukasz Brożek "Dark theme" is a good idea. v agnès It could be made easier to join the weekly theme. Thank you anyway for everything. jokele I was going to add the same here, after I read @Kazziz thread about deleting accounts. Kazziz Since I put up a talk about deleting accounts, how about making an account private, like on IG? Dominique So if people have a private account you need to ask to follow? And theor images no longer appear in the feed? Paweł Kadysz "Your existing followers won't be affected". So if you already follow someone and they make their account private - you'll be automatically approved, since you've already been following that person before. Only the new followers will have to be approved. Nicolas Camenisch I would propose that all tags beginning with "theme-" can only be created by Tookapic. That way you don't end up having to find out which tag is the correct one for this weeks theme (eg. theme-triangle, theme-triangles or theme-trianglese). ponzu Please don't kick me too hard for this... but... I like Tookapic as a "photo a day" project platform. It has everything I can think of. If I am not posting a photo a day, it's because I am lazy and not because of anything Tookapic lacks. I also like Tookapic as a photography-themed hangout. A go-to page of sorts. It has great photos and galleries to browse, cool and smart people to talk to, blog posts to read, etc. If Tookapic became a hangout place with 365-type project platform at its core, it would attract more users, became more financially solid, etc. Just my thoughts. For me, to become my favorite (or only) photo hangout on the web, it's missing the ability to upload and share in a blog-style post more than one photo per day. Not saying it's the only thing that is standing between me and returning to Tookapic. But it is one thing I remember missing about Tookapic when I was active. Basically, I am thinking about opening up a version of the existing Blog to all users, with anyone being able to run his or her own blog and fill their posts with any number of photos. Maybe the photos can be hosted elsewhere. So perhaps the one feature I am missing is not multiple uploads, but a personal blog. But if you move towards giving everyone a blog, then why not allow multiple uploads? Obviously, only one will go on the project page. But it can contain a link in the comments to "here's what else went on that day for me photographically, and see how hard it was for me to pick this shot, and do you think I picked the best one?" I just hate throwing away 99% of the photos. 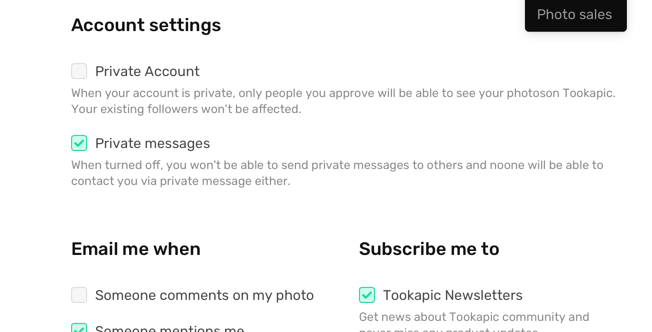 I can post them to Flickr, and I do, but I am talking about making Tookapic my one and only photo site. That would be something you would be proud of, beating back Flickr, 500px and Google+, wouldn't you?